NASA's Mars rover Curiosity captured this self-portrait at the Namib Dune of the Bagnold Dune Field. Mars harbors a mysterious kind of dune-like structure that's unlike anything seen on Earth, a new study reports. These unusual sandy ripples might yield insights about how Mars has evolved over time from a potentially habitable world to the harsh, dry planet we know today, researchers added. This photo by NASA's Mars rover Curiosity shows large wind ripples with superimposed small ripples on the Namib Dune of the Bagnold Dune Field inside Gale Crater. Now, by analyzing high-resolution images taken by NASA's Mars Reconnaissance Orbiter and Mars rover Curiosity, scientists have discovered a kind of bedform intermediate in size between the tiny ripples and big dunes seen on Earth's landmasses. These bedforms "look similar to ripples that are formed by currents underwater on Earth," said study lead author Mathieu Lapotre, a planetary geologist at the California Institute of Technology. However, Mars is now too cold and dry for liquid water to persist long on its surface. As such, "the ripples were not created by a liquid, but by winds of the Martian atmosphere," Lapotre told Space.com. To explore the potential origins of these strange features, Lapotre and his colleagues developed a model based on decades of experiments involving flowing water and sand on Earth. They found the model could predict the spacing between the crests of the newfound Martian bedforms. The researchers suggest that these Martian bedforms may result from how the viscous nature of air can have a greater effect on sand in the low-density atmosphere on Mars than on Earth. They named these structures "wind-drag ripples." "I find it fascinating to witness how different planetary environments affect the physics of geological processes," Lapotre said. To see if they could find ancient evidence of wind-drag ripples on Mars, the researchers analyzed data collected by NASA's Opportunity rover at the Burns formation, a bed of rock up to about 3.7 billion years old. They found signs of these ripples in that ancient rock. The research team's model predicts that wind-drag ripples get smaller the thicker Mars' atmosphere is. As such, detecting traces of wind-drag ripples in ancient Martian rocks could help scientists trace how the Red Planet lost its atmosphere and become drier over time. 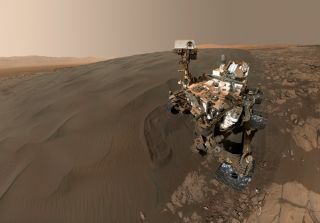 "We can now look back at Martian wind-blown sandstones with rovers and interrogate preserved 'fossil' ripples to constrain the density of the atmosphere under which they formed," Lapotre said. "Thus, wind-drag ripples offer a new opportunity to retrace the fate of the early Martian atmosphere." The scientists detailed their findings in the July 1 issue of the journal Science. Follow Charles Q. Choi on Twitter @cqchoi. Follow us @Spacedotcom, Facebookand Google+. Original article on Space.com.